This wonderful multi pen will roughly set you back £15.98 and comes in a wide range of barrel colours. The one I received for this review is black. One thing to bear in mind is that you don't receive any refills for the Lumio, these have to be purchased separately. They come in a 0.4mm or 0.5mm option, cost £1.90 each and come in at least 10 different colours. I am using the 0.4mm refills. I have been using the Lumio for nearly a month now and I have loved every minute of it. 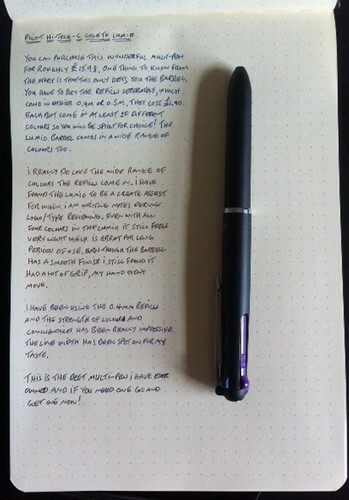 What has impressed me the most is the quality and consistency of the ink flow. I have been using the Lumio mainly for highlighting or making notes during logo and type proofing and its been a real asset. The Lumio, even with all four refill slots used, is still very light in weight which is great for extended periods of use. The barrel still grips very well and I didn't find my hand losing grip at any point. Even though this is a tad expensive I still love the Lumio and would happily recommend it.